After consuming truckloads of limes and bushels of mint, we've narrowed the best mojitos in the city down to two finalists. After fielding plenty of mojito recommendations from readers, friends and coworkers, we split up and set out to find the ultimate. In an effort to compare apples to apples—as opposed to prickly pear, watermelon and even strawberry-basil-balsamic—only true mojitos were consumed, those with nothing more than rum, lime juice, sugar, mint, club soda and ice. We’ve each narrowed down our picks; now it’s up to you to pick a champ from our two winners: Matchbox and Carnivale (see the poll at the bottom of the page). Powdered sugar dissolved into a cloud once lime juice was added and a fistful of mint was given a proper beating with a muddler to release the oils. The dark Ron Botran added a nice caramelly rum flavor. The sheer size of this cocktail and the good dose of rum mean you might want to stick with just one if you’re driving. But the balance of simple syrup, mint and pulpy lime juice is so good you might opt for a second and walk home. Ice pellets instead of cubes made for a cool, refreshing drink, and the liberal dose of good rum reminds you it’s a cocktail and not just a citrusy spritzer. The second-floor “Volcano Room” stocked with 80 rums isn’t quite running full speed, but until it is, main-floor bartenders will mix up mojitos on request. The bottled dark-cane-sugar syrup was key, lending an earthy sweetness to the well-balanced drink. Poured into a thick, handblown glass and nice and icy from some vigorous shaking, this mojito sure was nice to look at. But too much lime juice overpowered the rest of the flavors and made for a mega-tart, pucker-upper. Mint and sugar dominated this mojito, making it tough to get much lime punch and nearly impossible to taste any rum. Flat club soda sucked the desired fizzy factor right out and there wasn’t enough ice for a truly cold drink. A superfriendly bartender made us want to love this mojito, but the use of Bacardi Limón gave the drink a fake-tasting, syrupy effect that was tough to combat, even with heaps of mint and bright lime juice. After a quick stir with a straw, this cocktail exhibited all the best aspects of a mojito: piquant lime, sweet rum and an easy hand with the sugar—just enough to highlight the bright flavors of the organic mint. Perhaps the driest of the bunch, Nacional’s mojito exhibited a pure, aromatic expression of mint, making it refreshing and dangerously drinkable. 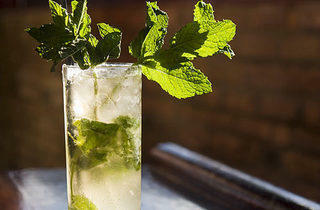 Ambition gets the best of the mojitos at this clubby restaurant. Wanting to pack in a ton of flavor, the bartenders pile in the mint and lime. The result is certainly bold but too acidic to drink without a distracting pucker. Refreshing and showing restraint with the sugar, this mojito would have fared better if it hadn’t been the smallest—yet, at $10, the most expensive—in the batch. 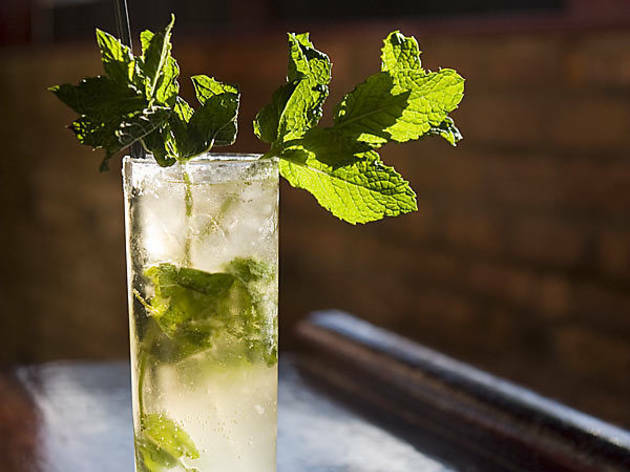 Everybody has a mojito in their hand at this bustling River North happy-hour spot. But the quickness with which the bartenders have to make them doesn’t work in the drink’s favor. Ours arrived with only a few pathetic leaves of mint floating in the glass. Strong drinks have their place, for sure, but this pint glass was almost halfway filled with rum, which overshadowed all the other flavors (and made it difficult to stand after drinking). This is a mojito for people who hate mojitos: The unbalanced proportion of club soda to rum, mint and lime makes for a drink so weak you can barely taste anything but bubbles.